We have carried and installed several different brands of pick-ups for the double bass in our shop. We have not had spectacular success with any of them, but I’m sure there are brands that we have not tried also. Our bass customers were needing a good sounding pick-up that hopefully didn’t cost an arm and leg, and I felt that we weren’t able to give them the best there was out there. 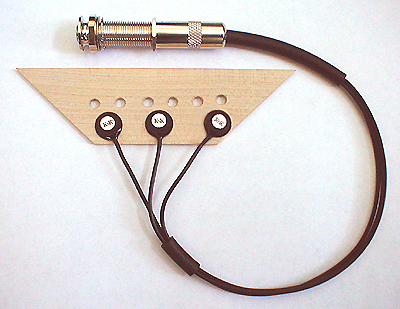 We have been selling and installing the Fishman bass pickup. Not because it was great, but because none of the others were any better and I had always had good luck with their acoustic guitar pickups. They were very reliable and it wasn’t too difficult to install, unlike some other brands that were a nightmare. One day one of our customers asked us if we had tried the K & K Bassmax double bass pickup. We hadn’t, and were discouraged with the one we were using, so we ordered one just to try. The K & K came in shortly, and I contacted the customer and made arrangements for him to come by and we would test it out on his instrument. I left the original pickup on his bass and installed the Bassmax along side of it, which was an easy install, and plugged it in. We could not believe the difference in the volume and tone this pickup had over the original. It was as if the original pickup was a toy compared to this pickup, and the K & K was even less expensive. The original pickup was very thin sounding and had low output, but the K&K was loud and punchy. We would plug in the K&K, then the Fishman, tried different amps, and the K&K was a real winner! We thought so highly of the K&K that we recently tried one of their 3 sensor guitar pick-ups, the Pure Mini. A customer that had purchased the K&K bass pick-up wanted to replace the pick-up in his Martin HD16 RLSH (RLSH = rosewood, large sound hole). We had previously installed his present system in his guitar but the K&K bass pickup had worked so well for him that he wanted to try the K&K Pure Mini system. After installing, we tested the system and found it to have a very pure unaltered sound. It’s sound was very solid with plenty of volume and was punchy without being sensitive to feedback. To me it produced a very natural sound of the instrument, that is, the sound of the instrument plugged in was very close to the natural sound of the guitar when unplugged. I don’t think that there is a pickup that will produce a sound equal to a good microphone, but this one is as close as I’ve found. In fact, I don’t recommend putting the K&K in a guitar that has poor or mediocre acoustic sound, because I think the Pure Mini will only amplify what it hears. You will have to use a system that gives you the option of embellishing the sound if that’s the kind of instrument you have. Needless to say, we now carry the K&K pickups and reccomend them highly. We haven’t tried all of their products, but I know for sure their Double Bass “Bassmax” and the acoustic guitar “Pure Mini” system is great. I’ll try to add additional information as we install and test some of the other systems they offer. This entry was posted on October 23, 2010 at 11:39 pm and is filed under MUSICAL INSTRUMENTS....	You can follow any responses to this entry through the RSS 2.0 feed. Both comments and pings are currently closed.